FALL RIVER – Using classical music as his main vehicle, Carl Palmer, former drummer of progressive rock band Emerson, Lake & Palmer (ELP), is performing instrumental rearrangements of classic ELP songs as part of a power trio for his most recent solo tour called “Pictures at an Exhibition.” On Oct. 22, he will be playing the 22-minute song of the same name, plus unique adaptations by classical composers, at the Narrows Center for the Arts in Fall River. They will also perform “Fanfare for the Common Man,” by American composer Aaron Copland, as well as “Nut Rocker,” a song by the instrumental ensemble B. Bumble and the Stingers, which was inspired by “March of the Wooden Soldiers,” from Pyotr Ilyich Tchaikovsky’s famous ballet, The Nutcracker, and covered by ELP. By exchanging the synthesizer for guitar, Palmer said he thinks the music “stands on its own,” making it difficult to compare to ELP. He also believes guitar is a much better fit for him and holds guitarists in high regards. Palmer said finding the right musicians to tour with is important. Guitarist Paul Bielatowicz and bassist Simon Fitzpatrick join him. Because he respects music as an art form, he agreed to be featured in “The Solo,” a 35-minute film that portrays the drum solo as a work of physical art. Acclaimed U.K. filmmaker Andrew Cross asked him to be part of the project last year. During its run in U.K. art museums, it received rave reviews from art and film critics. It just made its U.S. premiere on Oct. 8 at Cleveland’s Rock and Roll Hall of Fame and Museum as part of their Legends Series programming. 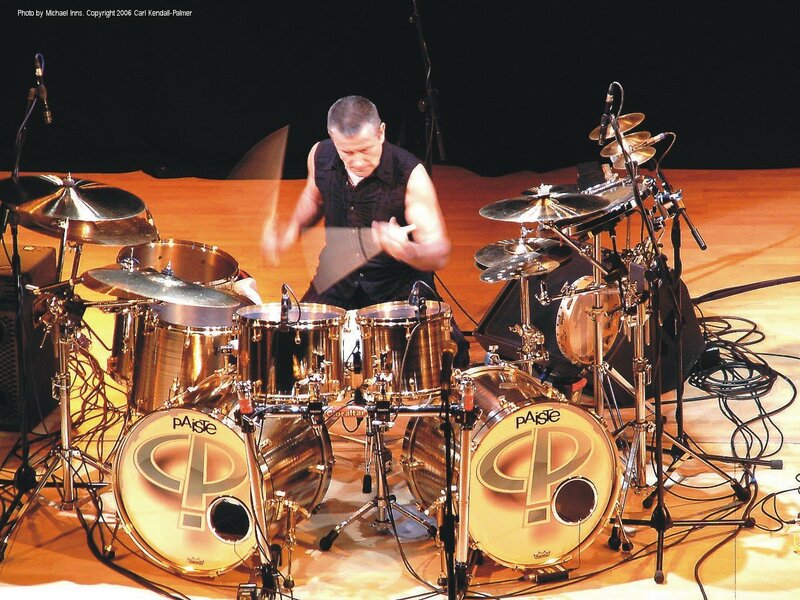 Additionally, he recently launched a new iTunes mobile application, Play Carl Palmer’s Drums, which was developed by Dynamic Websites. Designed for iPods, iPads and iPhones, the application allows users to download Palmer’s drum kit so they can use their fingers to play along to music through their iTunes program. It includes rare Palmer archives and instant updates from his site. The application was originally featured on his website nearly five years ago. After it was removed, fans let him know they wanted it back. “We had people request it so this time we released it as something you can put right on your phone, rather than having to go to my site like you did years ago to play the drums,” he said. To further please his fans, he holds a meet-and-greet session after each show to give them a chance to introduce themselves to him. He takes pleasure in meeting them for a handshake or autograph. While he believes the demand for meet-and-greets are at a high, he doesn’t feel that the progressive rock movement that ELP was a huge part of in the ’70s will ever be as popular as it once was. He enjoys the English band Porcupine Tree and the first album by Mars Volta, but thinks the genre won’t make a comeback. After he wraps up the tour at the end of the month, Palmer will head to England to start a 10-day tour. In early 2012, he hopes to make a new album with the band Asia that also features John Wetton, Geoff Downes and Steve Howe, and tour later in the year for the bands’ 30th anniversary. The Narrows Center for the Arts is located at 16 Anawan Street in Fall River. Tickets are $48 advance and $53 day of show. Tickets can be purchased online at www.ncfta.org.